Post news Report RSS	0.4.6 Released! Alpha 0.4.6 released. Important features include an all new starting area, complete with quests, ambient sounds, new items, usability improvements, and bug fixes. Ambient sounds implemented. This allows for placement, effective radius, volume, and falloff. A small example is located at the dock to the south of the starting farm. Phase I of the default campaign is complete. It consists of 4 short quests, centered around a farm, that are designed to introduce several aspects of the game (planting, gathering, and crafting). The quest system was fleshed as well for this release. Implemented a quest item flag, as well as crafting and planting quest objectives. Items on tap for 0.4.7 include completing the ambient sound editor, and implementing a temporary guest login feature for those wanting to take a peek at the game but are not quite ready to register. Phase II of the default campaign should go in, leading the player to the regional capital and introducing them to combat. For an added bonus I put together a short video detailing an interesting aspect of the game: Campfires. Campfires can be crafted and placed by the user. They can function as a crafting station for the cooking skill and must be fed fuel to keep them going. They can also be extinguished with a bucket of water and will melt any snow that they are placed upon. Fixed an issue with the campfire’s ability to slowly burn out. When clicking on a quest NPC who is too far away to initiate the quest dialog, the player will now attempt to move into range. Fixed an issue with placeable item update actions not being disposed of upon placeable removal. Fixed the wording on the quest “March of the Birnam Wood”. The pond is east of your location, not west. If accepting a quest or completing a quest causes the quest dialog to be empty of content (there are no further quests or dialogue) then the dialog will close itself. Fixed an issue with incorrect quest indicators appearing for quest givers. Added a drawIcon() function to quest triggers and resolvers. Quest details will now show the person you must turn the quest in to in the upper left corner. Fixed an issue with a persistent ws:/ call to an undefined server. Moved available slot check when clicking to craft an item to the server-side. Select the first item in the quest dialog on opening or updating of the list contents. Lightened the link font color in the quest progress detail frame. Added game.showRecipe(recipeId) function. This will show the recipe in the lugdunon.net cookbook in a separate window/tab. Added client notification command. This will show a dialog on a specified account’s client or all clients. Added findAvailableSlotForItem() to the Character class. Fixed some issues with npc defs and sprites. Added a client side notification quest completion condition. Redesigned the oven placeable item to correct (LUGDUNON-262). Added candles to the default campaign character’s action bar. Fixed it so that digging up a fir tree drops a fir tree item, and not an oak tree item (LUGDUNON-263). Fixed an issue preventing macros from being added to the action bar (LUGDUNON-266). Fixed some dialog with the current quests. Lessened the cost on creating metal rings and mail, so that it will be more economical to craft mail armor. Journeyman and Apprentice were swapped in the About / How to Play section of the website. This has now been rectified. Added acceptance text to quests. In the even of an NPC trigger, this logs to the console as “npcName says: acceptanceText”. Fixed a bug that was causing the ! to show for a completed but not turned in quest on a quest trigger npc that was not also the resolver. Fixed a bug that was allowing a quest to be completed at the trigger npc that was not also the resolver. Allowed the live log console to wrap text. When a new item is given to a player character, attempt to place it in the action bar before the inventory. Filled buckets from quest flagged buckets are now flagged as quest items as well. Emptied buckets from quest flagged buckets are now flagged as quest items as well. Crafted items made from quest flagged items are now flagged as quest items as well. Added advancementSatisfiesPrerequisites() method to server-side ICharacterStats class. Default stack size to 1, not 0. Debit quest items to look in crafting block now as well. Added craft item quest progress tracker. Starting a quest can now grant advancements. Added instance template and placeable item for Uncle Owain and Aunt Peru’s farmhouse. Removed all items from the default campaign character template. Set the spawn point and name in the default campaign’s world.cfg. Added isQuestItem and questDefinitionId flags to ItemInstance class. Items flagged as quest items can’t be moved to containers, or stacked with items of the same item definition that do note share the quest item flag. Fixed duplicate character bug (LUGDUNON-255). Added a PlaceItem metric. Tracks items placed in the game world, with separate stores for play and edit mode. Added a notification (and exception server side) if a quest acceptance fails. Added notification if moving an inventory item fails. Added findEmptySlot() and countEmptySlot() methods to server-side Character class. Fixed a bug that was causing a container dialog to appear when a GM deleted it. Added newQuestItem() method to ItemCache class. Added getItemDefAndStackSize() method to ItemDefinitions class. Added a ‘transient’ metric value to the metricUpdated() method in the IMetricListener interface to allow for metrics to send data to a listener that isn’t necessarily tracked in its store. Added ItemDebit and PlaceableRemoval quest abandon conditions. Added PlaceableRemoval quest completion condition. Added waterfall and wave (ocean) ambient sounds. 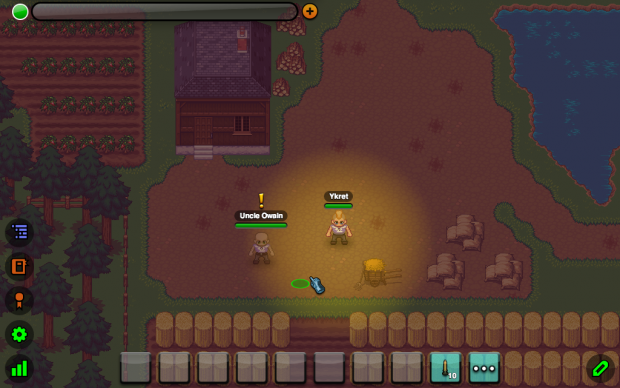 Added initial quest giver at the family farm and implemented the first quest “Working on the Farm”. Added quest item indicator to inventory item icons. Added hops seeds, produce, and placeable plant. Added boats (they just look pretty and don’t actually do anything). Added net.lugdunon.util.Math.distanceFromPlayerLocation(d) to client API. Added abrupt, linear, and cubic falloff modes for sound emanators. Fixed an issue causing chat text to not wrap (LUGDUNON-252). Fixed length of chat input field. Fixed issue with valid equipment check when attempting to place an item in an equipment slot (LUGDUNON-254). Fixed an NPE caused when attempting to /warp in edit mode. Fixed erroneous exp awarded notifications (LUGDUNON-253). Added the ability to generate elevation data from images in the terraingen utility. Added two carts (empty and hay-filled), several logpiles and sacks, and wooden dock placeable items. Created the basic environment for the starter campaign. Hammered out the quests for the initial quest hub (the family farm) with the help of Zippy. Identified and logged 5 more issues with the help of Xavion. Added expiration to audio assets as they are pushed out of a channel. Added a main player moved event API to the client. game.addMainPlayerMoveListener(listener) game.removeMainPlayerMoveListener(listener) and listeners implement mainPlayerMoved() function. Added a removed() function to PlaceableItemInstances. This is called whenever a placeable item instance is removed from the client-side game world. Added an audio emanator placeable item. This item will cause a sound to play on the client when the main player character moves within range. Added two new houses and instance templates to match. Fixed a bug in the /played command code that was referencing the current active character’s name incorrectly. Fixed an issue with the server hanging. IUpdateable.update() and CommandRequest.process() calls now have a hard limit of 2 seconds to execute. If either takes longer then it is prematurely terminated at the 2 second mark and a logging statement is issued to inform the server op of the condition. Added ping.interval setting to world.cfg. This allows for custom ping times if the server operator desires. Value is in milliseconds. Default is 6000 (6 seconds). Wowza. Gonna definetly follow this!